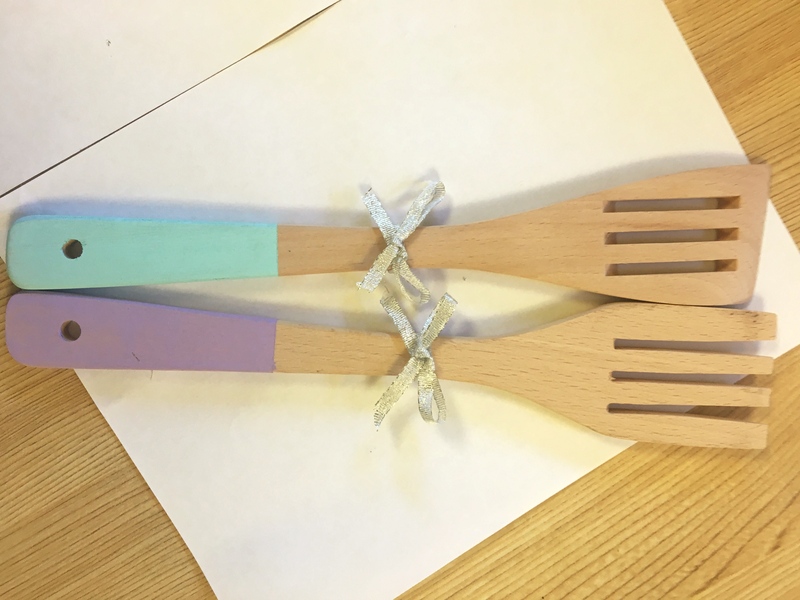 A Craft Party is a great way to spend time with other people while learning a new skill. 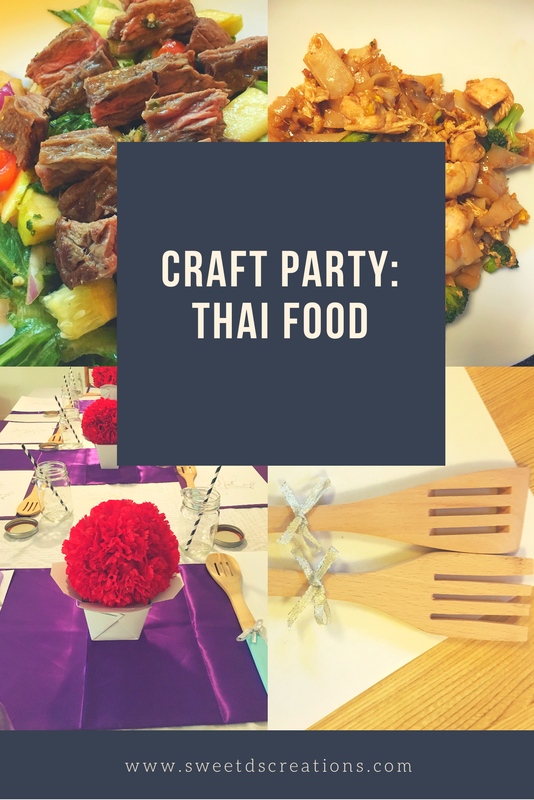 During the Craft Party: How to Cook Thai Food, we enjoyed eating, talking, laughing, and a good glass of wine with other ladies. I love planning and throwing all types of events. My craft party was kid free, so it allowed for much needed adult conversation without little ones interrupting. 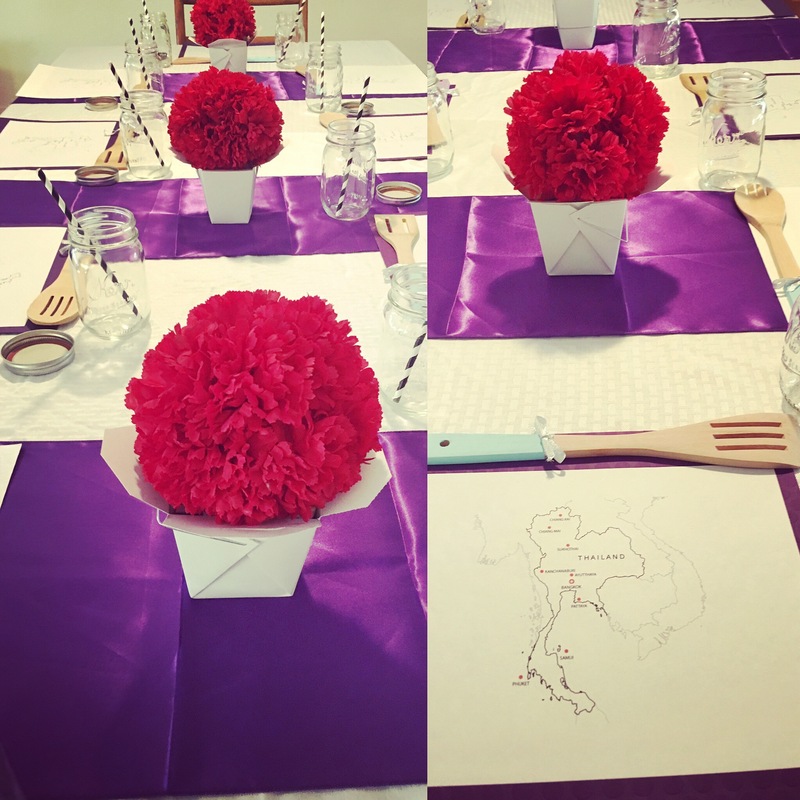 This month, I was able to team up again with ladies in the East Bay Mom’s Club and host Thai Food cuisine craft night. How did I decide on hosting a Thai Food night? 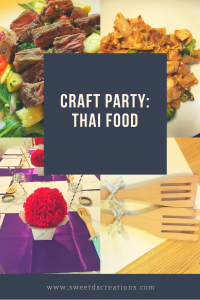 During our last Craft Night Missie R., from the #EBMC group and Blue & Harmony (FB Page), mentioned that our next craft night should be Thai food. The ladies were very excited to learn Thai food recipes, so I planned the event. During the event, I taught the ladies how to makeThai Iced Tea, Thai steak salad, and Pad See-Ew. Missie taught us how to make her Spicy basil fried rice. We ended the night with dessert and a lot of laughs. I made a Thai inspired mango lime cheesecake. All food prep was done prior to starting the party. A couple ladies helped us chop up all the ingredients when they arrived. During the party, it was a team effort, with ladies helping put together dishes or cook the food. Of course, some preferred to watch with a glass of wine in their hand. We started off the night cooking on a separate plugin electric cook top. However, it wasn’t getting hot enough, so we did what all moms do, we came up with a new plan to make it work! We finished cooking the food on the kitchen stove. 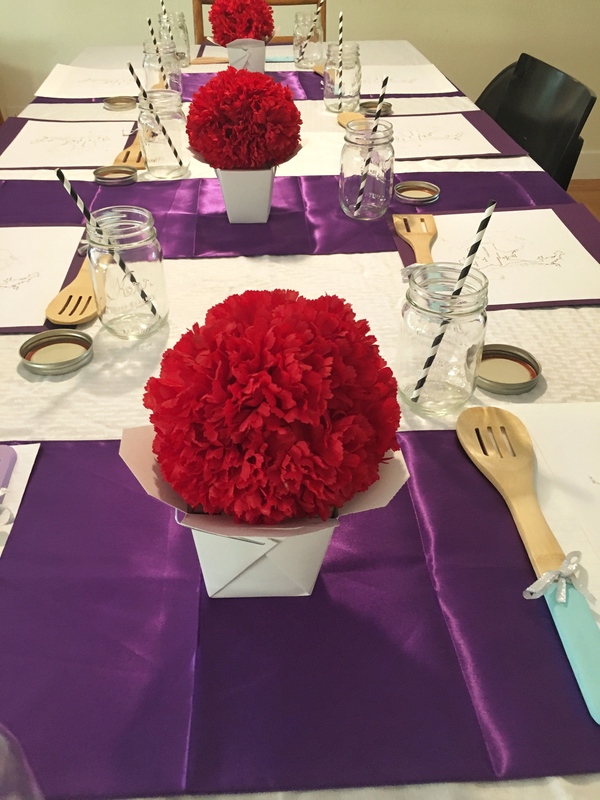 Remember when doing a cooking party, its very important to ask about any food allergies or diet restrictions to plan your menu accordingly for all guests. We accidentally planned “vegetarian dishes” that had oyster and fish sauce in them, oops! 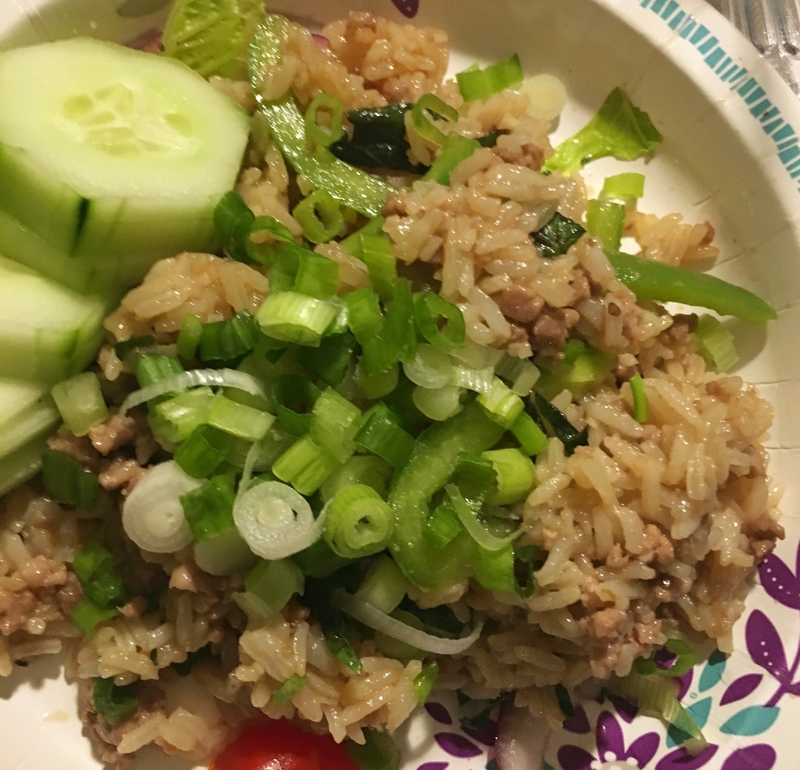 Missie demonstrated how to make her spicy basil fried rice recipe. We had a vegetarian option with no pork. In large skillet over high heat, heat up veggie oil (4-5 tablespoons). Remove the garlic chili oil mixture and put in heat proof bowl. Mix in diced onions and sauté until translucent. When meat is done, add rice to pan. Add chili oil mixture over rice. Add large amounts of oyster sauce around the rice. Mix it up until its 2 shades darker than Carmel color foundation. Rip up all Thai basil leaves and add to rice. Add cucumbers on the side and a big handful of green onions for garnish. Add a few fresh basil leaves in middle to make it look Food Network worthy. 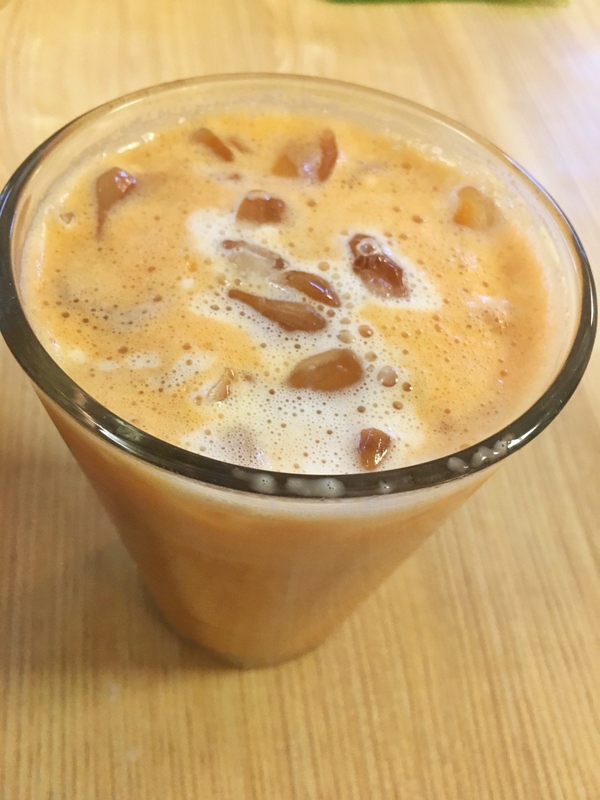 Using a tea sock, we made Thai iced tea in a giant pot, then the ladies added sugar, sweetened condensed milk, evaporated milk, and ice to their individual glasses. Check out the full recipe and video here. 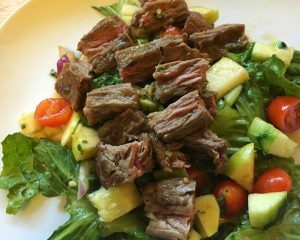 Thai steak salad has a LOT of ingredients. We did most of the chopping prior to the party starting. During the party I had ladies make the salad dressing. We had two batches of salad dressing, a spicy one and a not so spicy one. For the spicy one we used a whole Serrano chili with no seeds, but the people who like spice didn’t think it was spicy enough. Your mileage may vary. 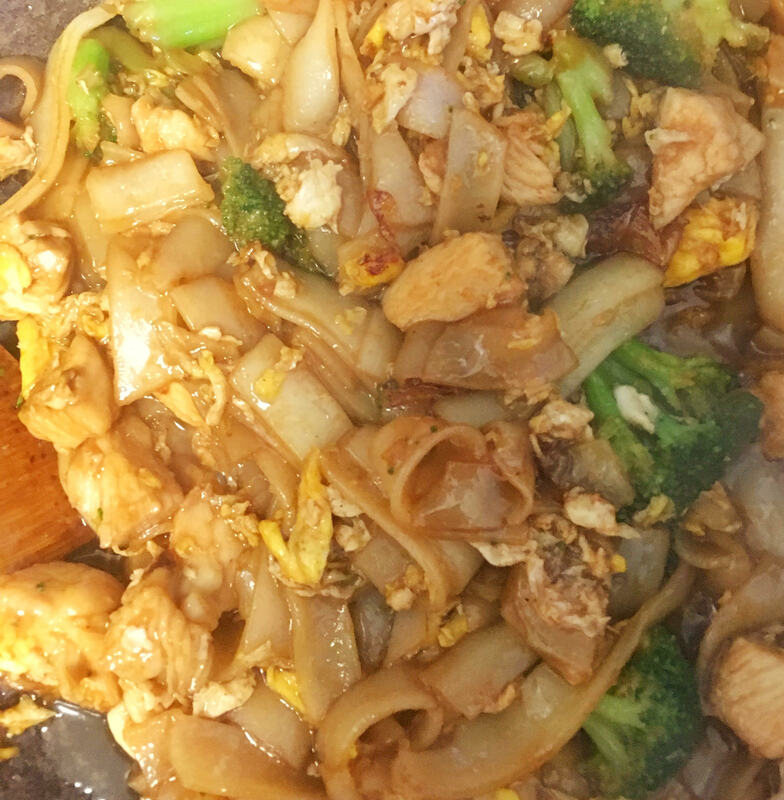 The last dish we cooked was Pad See-Ew. One of the guests cooked the dish in the wok during the event, since I had already prepared the chicken before the party started. For the full recipe and video click here. The dessert was made prior to the class. I took a basic NY Cheesecake recipe and added 2 tsp of lime juice, 1/2 lime peel, and 1 mango to it. After baking, I then topped it with lime peel and whipped topping. 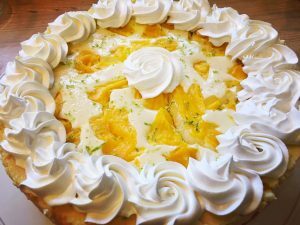 I created a Thai inspired mango lime cheesecake. 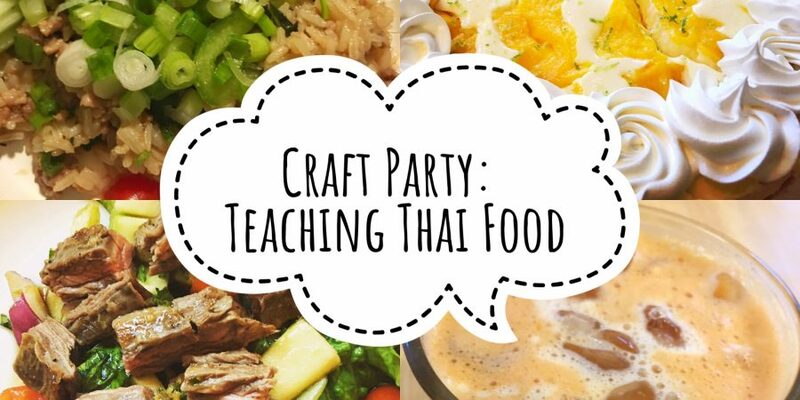 When planning the Craft Party, I had no idea what Thai influenced decor I should use. So, I did what everyone else does, went to Pinterest! I searched and pinned different Thai party themes and decided I should go with purple and red. For the table I used my white tablecloths and purple table runners. 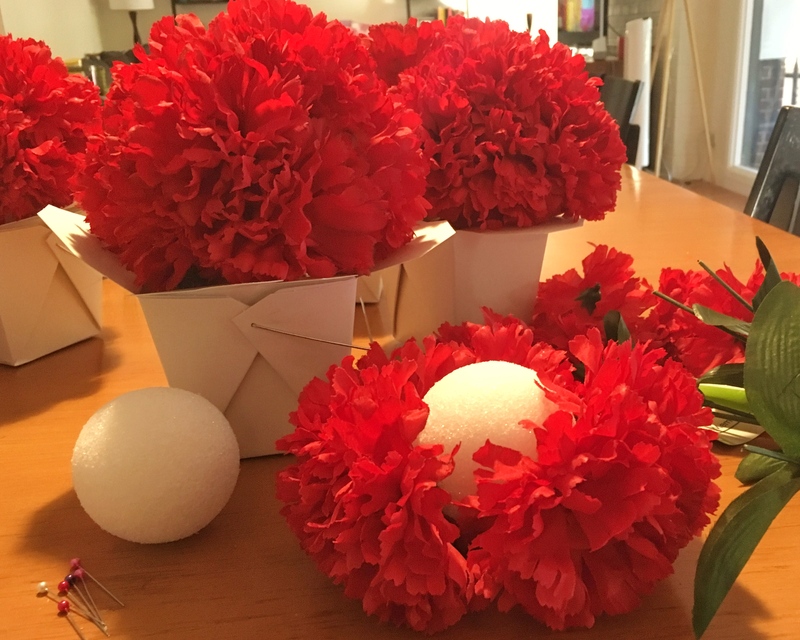 As centerpieces, I took takeout boxes that I found on Amazon and placed styrofoam balls of red artificial flowers on top. We had extra takeout boxes too, so that came in handy when guests wanted to take food home. For placemats, I printed a map of Thailand and glued it to card stock. 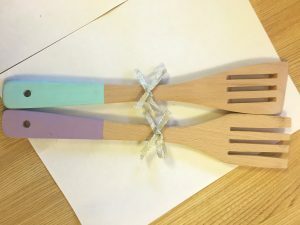 For the party favors I bought packs of wooden spoons and painted the bottom of them in light purple and light blue acrylic paint and tied silver ribbon to them. Everyone got to take a spoon home. Check out the tutorial here. The Craft Party was full of food, talking, and laughs. It was a great way to connect with other ladies and learn new recipes! 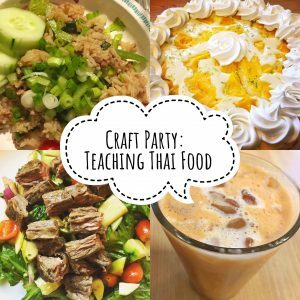 I love the idea of a craft party! And my sister in law is Thai and makes Thai food all the time, i have to say your pictures look perfect for auethentic Thai recipes! Thank you! Craft parties are so fun. You’ll have to try one.